Home/What was the problem to solve? 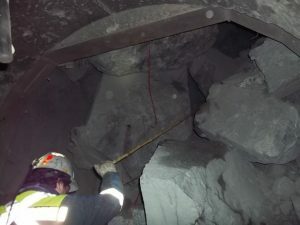 Safe inspection and removal of rock blockages has been an age old problem in mining creating potentially dangerous situations for personnel and blocking production. Many alternative approaches have been attempted with limited success. However the method of choice is still the use of long poles (bamboo or fiberglass) with explosives charges attached and then inserted into the blockage. As can been seen in the photo on this page, this approach is in need of innovation for safety and production purposes. Penguin has developed a robotic system to accomplish task.